Today I will be blogging about the LAQ Cherry head. The Cherry head was released back in July and it is now available in the LAQ mainstore. LAQ sells their main bento HUD separately, which you only need to purchase one time. After that, you can buy as many LAQ bento heads as you like, they will all work with that one single HUD. Body Appliers: They have released new ‘Next Level’ body appliers with 1024×1024 resolution. These appliers are available for Maitreya, Belleza, Slink and Omega and they cost L$300 per skin tone. Omega Compatibility: Some LAQ heads come with omega pre-installed and some don’t. You can pick up the Omega System Kit for LAQ heads on the marketplace if you need it for your head. Motion Capture Animations: To get the animations to work on the head, you must purchase the main bento HUD, which is sold separately for L$3000. Customer Service Questions: If you have any questions about this head, it would be best if you looked at the designer’s profile, her name is Mallory Cowen, to see how she prefers to be contacted for customer service issues as I will probably not be able to assist you with that. LAQ 3rd Party Compatible Products: If you’re looking for skins, shapes, cosmetics and more, which are compatible with your LAQ mesh heads, check out the LAQ !Advertising ONLY! Flickr Group. Other LAQ Bento Heads I’ve blogged: Other LAQ Bento heads that I’ve blogged in the past are: Athena, Vivien, Sandy, Poppy, Zahra, Leia, Skye, Scarlet, Rebel, Rina, Neve, Nyx, Lulu, Jade, Ana, and Gaia. 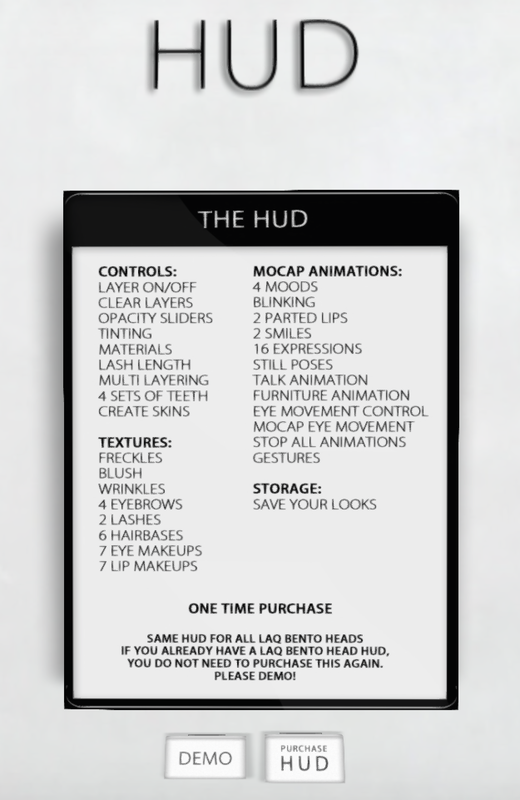 Price: The main bento HUD is available by itself for the price of L$3000 at the LAQ mainstore. Any of the LAQ bento heads will work with this HUD and they will all only be L$1500 each. Hide/Show: Check or uncheck the face tattoo or ears to make them hide or show. Eye fx: This feature adds shading and eye reflections on a separate layer from the eye itself. This way, shading and reflections stay intact even when your avatar looks around. Your eyes will also reflect light in the evening. You can turn this feature on and off and play with its opacity. Mouth: You can turn both mouth layers on or off to hide or show the lipsticks on both layers. Neck: You can turn the blender on or off and also pick your neck size to match up with your mesh body. Skin: This tab has a link to the Laq mainstore where you can pick up a skin for your head. The skin for each head costs L$990 for all tones. You can also clear the skin in this tab as well as tint it. Tattoo: There are 5 tattoo layers giving you the option to apply 5 different kinds of tattoos on your head. You can also control the opacity of each layer as well as tint them. It comes with free mole, blush, freckles and wrinkles. Brows: You have a choice of 4 brow tones as well as an option to tint them. You can also control the opacity and clear if preferred. Lashes: There are two lash options in which you can control the length and opacity on both the opper and lower lashes separately. You also have tinting and masking options. Hairbase: There are 6 hairbase colors along with tinting and masking options. Eyeshadow: The head comes with 3 eyeshadow layers giving you options to apply up to 3 layers of shadows and liners. You can also tint and control their opacity. It comes with 7 free shadows. Lipsticks: There are 2 lipstick layers so you can apply up to 2 lipsticks. You can also tint and control their opacity. It comes with 7 free lipsticks. Blinking, 2 parted lips and 2 smiles. Teeth – Hide upper and lower teeth, choose out of 4 styles and tint. Looks: In the looks tab, you can save your favorite skin and makeup combinations for easier access in the future. Customer Service Questions: If you have any questions about this HUD, it would be best if you looked at the designer’s profile, her name is Mallory Cowen, to see how she prefers to be contacted for customer service issues as I will probably not be able to assist you with that. For more of my mesh head reviews and videos, click over to my Mesh Heads Category on my blog and my Male and Female Mesh Head Playlists on my YouTube channel. I have also created a page with a list of all mesh body parts that I have blogged. I have made my own shape for this head and as soon as I release it, I will link to it from this post. UPDATE: I just found out that there will be a Powder Pack for LAQ bento heads released on November 1st. I will have more information about that and possibly a giveaway very soon! Love this one, so young lol. You are always so thorough I have 0 questions about a head or hud after watching your videos….